Uranus is the seventh planet from the Sun and the third Gas Giant, and is currently the fourth largest planet in our Solar System, and has been named after the Greek God of the sky Uranus. The the father of Cronus of the planet Saturn and grandfather of Zeus of the planet Jupiter. 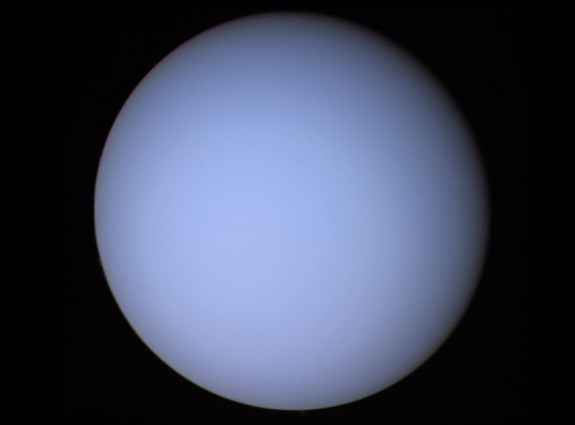 Uranus orbits around the Sun once every 84 Earth years, and as with Venus, Uranus is the only other planet to rotate from east to west on its axis. The Atmosphere on the planet is made up of 83 percent hydrogen, 15 percent helium and 2 percent methane. Unlike the other planets it spins on its side at a 97 degree angle. Its thought that a huge collision changed the planetary rotation pushing the planet into the position it now spins. 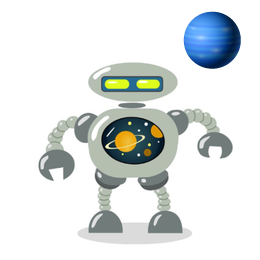 Like Saturn, Uranus is made up of hydrogen, methane and helium, however Uranus is a very cold planet and with Neptune is an Ice Giant. Although its thought that this planet has an ocean that maybe as hot as 2760 ?C. Like the other Gas Giants this planet also has rings made-up of dust and rock, together with 27 known moons orbiting it. Five of the large moons are Ariel, Miranda, Oberon, Titania and Umbriel. *A year on Uranus is equivalent to 84 Earth years.